This town has a storied history steeped in the Klondike Gold Rush of the late 1880s and is full of culture and brimming with life. Few one-time boomtowns retain the flavour of the gold rush days like Skagway with parts of the city seemingly stuck in 1897. This gateway to the Klondike is preserved as a national historic park with its rustic boardwalk and frontier-style storefronts. 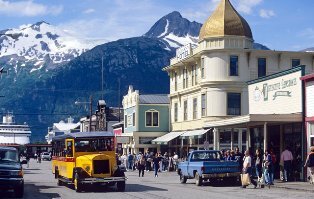 Due to its geographic location, Skagway enjoys a drier climate compared to the rest of southeastern Alaska, with an average annual precipitation of only 22 inches. When in Skagway the main attraction is the White Hall Pass train ride. This 3 hour train excursion follows the Klondike pass. However for at approx a third of the price is a bus that follows the exact same route. It also stops allowing you to get out and take pictures.